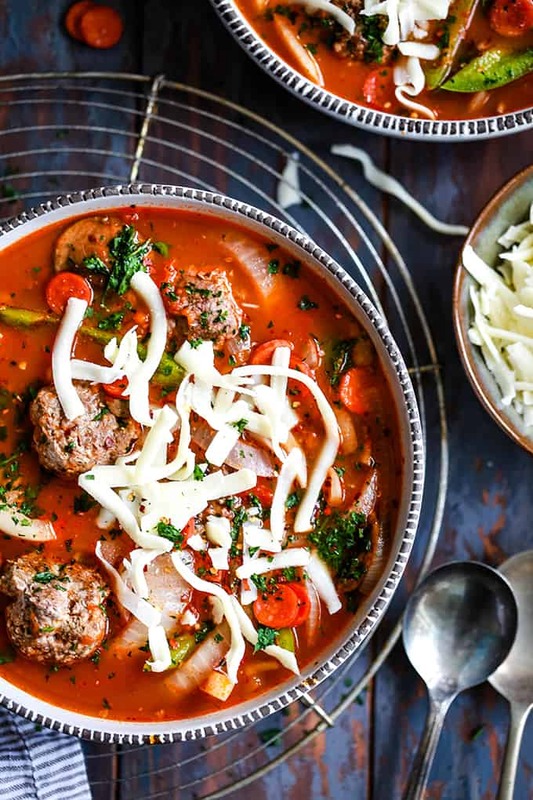 Thanks to a shortcut, this Meatball Pizza Soup takes just 10 minutes to prepare. Meatballs join your favorite pizza toppings in this comforting soup. Original content posted January 2017. Updated February 2019. 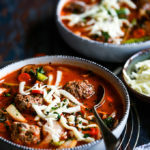 You never know when inspiration is going to strike and that’s exactly what happened with this Meatball Pizza Soup recipe. Each week, I poll every member of our family to see what ideas they might have for the following week’s dinner menu. Without fail, my four year old son’s requests are always first, spaghetti and meatballs and second, mountains of cheese piled high on my Perfect Pizza Crust. After week’s of the same requests, I wondered if it was possible to combine his two favorites and transform them into a completely new dish. The end result is a new favorite for everyone seated around our dinner table. 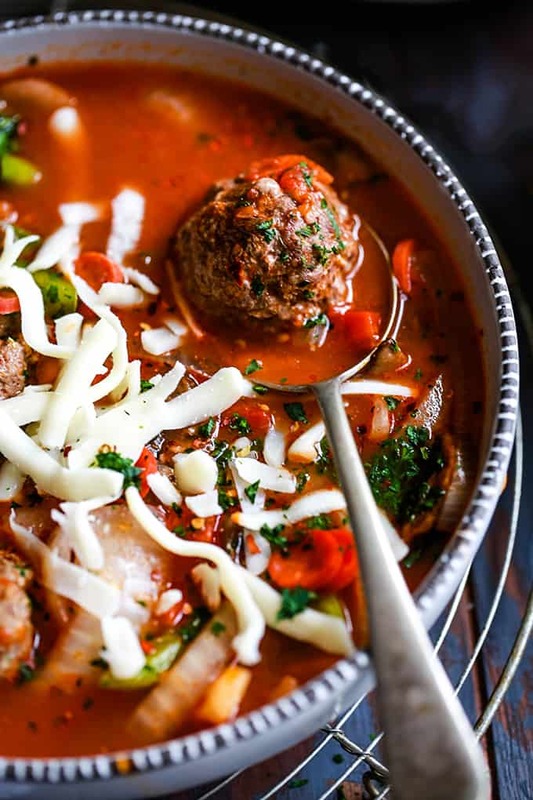 Can You Make Meatball Pizza Soup Ahead of Time? This soup is easy enough for a weeknight thanks to an easy shortcut. The meatballs in the soup are my Easy Baked Meatballs which can be made in advance. These are the same meatballs that are the star of my Four Cheese Meatball and Sweet Pepper Lasagna. Simply prepare the meatballs ahead of time and freeze and simply put them in the fridge to thaw the day before you’d like to make the soup. 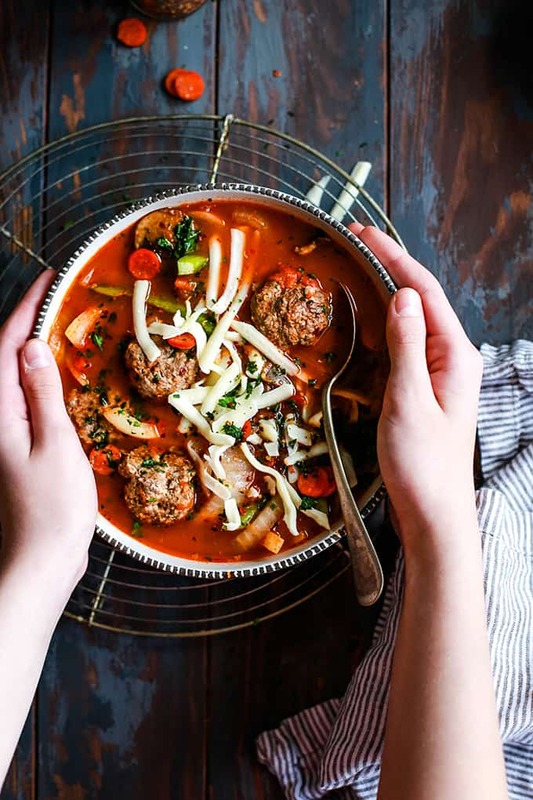 Thanks to this kitchen shortcut, my Meatball Pizza Soup takes just ten minutes to prepare. 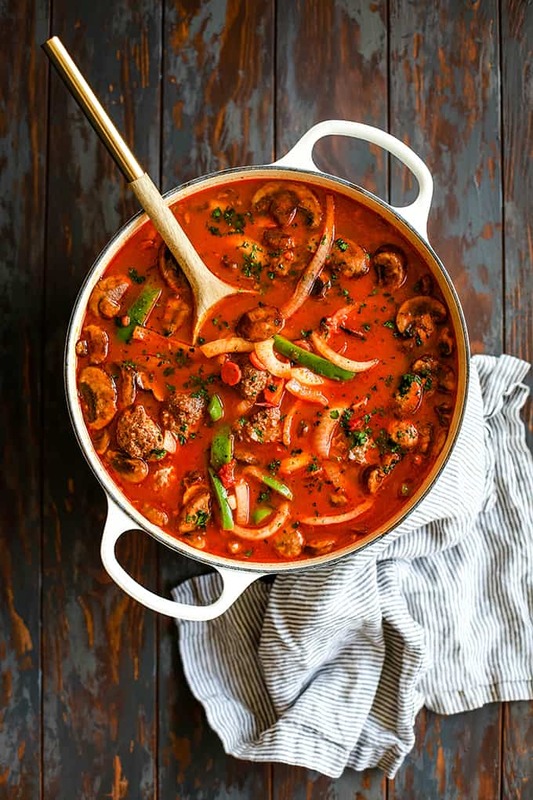 Meatballs, pepperoni, onions, green peppers and mushrooms come together to create a comforting bowl combining two of your favorite Italian dinners in one. Looking for an even more flavor packed option? Make the meatballs the day before you’d like to make the soup and then cover them with the marinara sauce called for in the soup recipe. 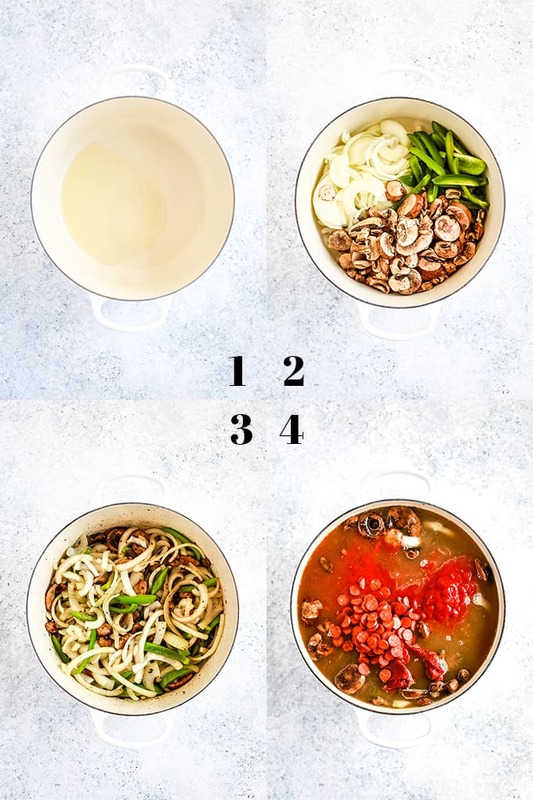 Refrigerate overnight and allow the meatballs to soak up all the amazing flavors of the sauce and then simply add both directly to the soup as called for. SO. EASY. In large dutch oven over medium-high heat, add olive oil. Add mushrooms, onions and peppers to dutch oven. Cook over medium heat until softened, stirring occasionally, approximately 8-10 minutes. Add beef broth, meatballs, garlic, crushed tomatoes, tomato paste and pepperoni. TIP: If you can find mini pepperoni at your grocery store, they’re perfect for this soup as they fit on your spoon easily! Stir together and bring to a boil. Reduce to a simmer and cook for 10 minutes until all ingredients are heated through. 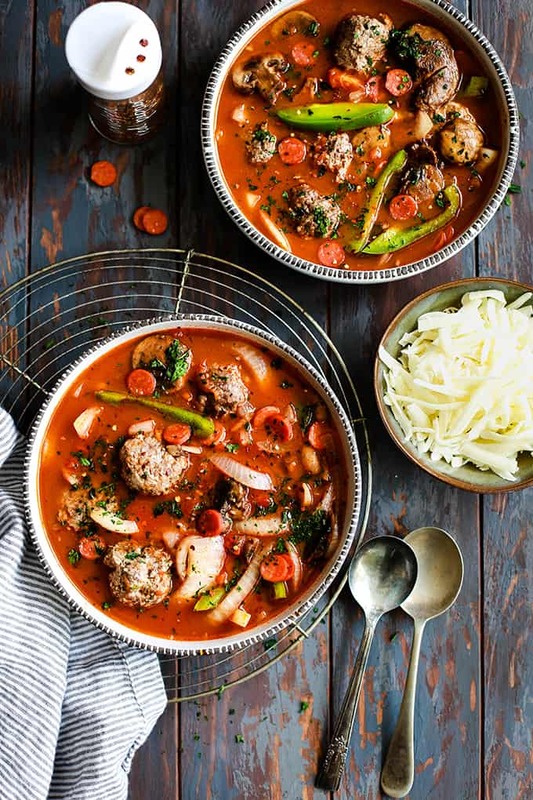 If you’ve tried this Meatball Pizza Soup or any other recipe on Melanie Makes, please let me know your thoughts in the comments below. I love hearing from you and respond to each and every comment! Thanks to a kitchen shortcut, my Meatball Pizza Soup takes just ten minutes to prepare. 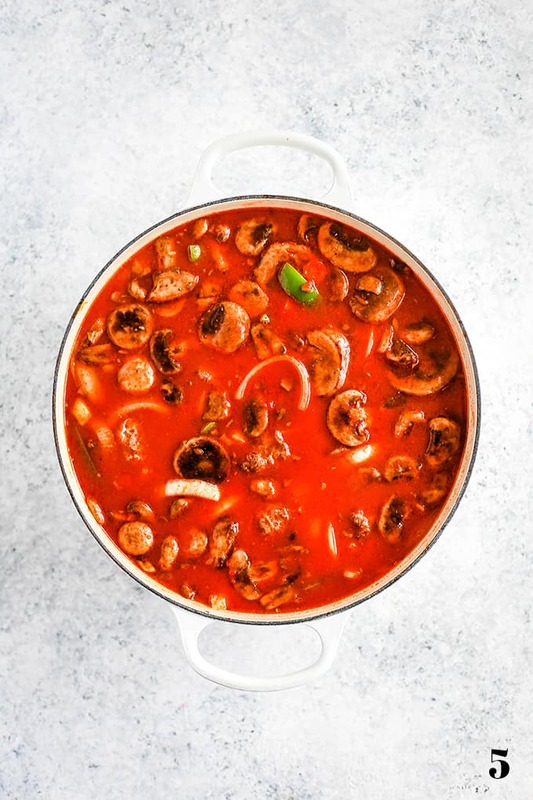 Meatballs, pepperoni, onions, green peppers and mushrooms come together to create a comforting soup that combines two of your favorite Italian dinners. Add mushrooms, onions and peppers and cook until softened, stirring occasionally, approximately 8-10 minutes. Add beef broth, meatballs, garlic, crushed tomatoes, tomato paste and pepperoni and bring to a boil. Reduce to a simmer and cook for 10 minutes until all ingredients are heated through. Serve soup garnished with red pepper flakes, mozzarella cheese and parsley. TIP: If you can find mini pepperoni at your grocery store, they're perfect for this soup as they fit on your spoon easily! I’ll be filing this Meatball Pizza Soup in the comfort food file, right before these Mac and Cheese Stuffed Meatballs and right after this Meatball and Rice Skillet with Baby Peas and these Three Cheese Italian Meatball Subs. This was an instant hit!! The soup was very flavorful and quick and easy. Thanks for the recipe! So glad you enjoyed it, Bee! It's still super cold here and this soup looks like the perfect way to use up the meatballs I have in the freezer! Making this week! Can't wait to hear what you think, Michelle! Love how comforting this is! This looks incredibly delicious! Thanks, Erin - it's so easy, too! WOW! This soup looks so comforting! I can confirm that it is, Allyson! The perfect bowl of comfort food! I'm in complete agreement, Jade! Now this is such an interesting idea ! I can’t wait to try this ! This recipe looks so hearty and delicious! Can't wait to make it this weekend! Can't wait to hear what you think, Stephanie! I would have to leave out the mushrooms. My husband will not eat them. Is there something I could substitute? Hi, Karen - Your husband sounds like my son! You could either leave them in and just let him pick them out - that's what I make my son do! - or you could simply omit them. You could try substituting some ground Italian sausage if you want something to replace it with. What a fun idea! I'm sure this made your son very happy! You bet it did, Laura! Excellent recipe! I made it Wednesday night and served it last night. Big hit. I used homemade meatballs that I had stashed in the deep freeze. So glad you enjoyed it, Lindsay! Thank you so much for taking the time to let me know - you totally made my day! This is truly making my mouth water! Sounds so delicious! My family will love this soup! I hope you'll give it a try, Anna! I could live on your soups! This looks incredible!! You are the sweetest, thanks Cathy! This soup looks hearty and filling. Winter comfort food at its best :-). I love soups that recreate the flavors of other foods! I'll definitely be giving this one a try! I hope you do, Sabrina! This is absolutely BRILLIANT! 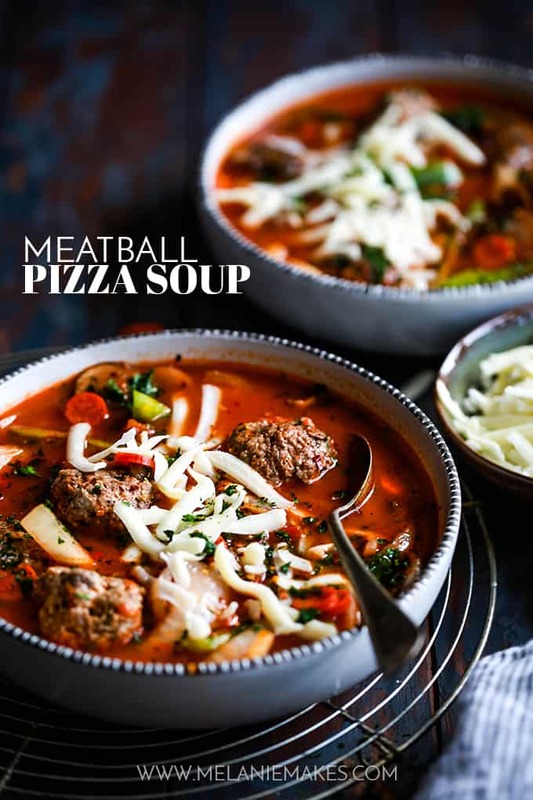 What a great idea to turn meatballs and pizza into SOUP. I have a feeling my daughter, as well as my husband and I, would love this! Thank you so much, Erin! You're so kind, Starla - thank you! I've never made meatballs at home, but every time we see them on the menu I order them! Maybe I should finally pull the trigger and make them for this soup! You definitely need to try making them yourself, Kelly - so easy and delicious! What a unique idea! I love it and I bet it tastes delicious! My husband already loves you for this. Adding it to the menu for next week! The cheese is killing me! The cheese pull on this soup is extreme! Can't wait to hear what you and your sweet family think!